According to general manager Ryan Pace, Floyd will have his fifth-year option exercised, Colleen Kane of the Chicago Tribune reports. 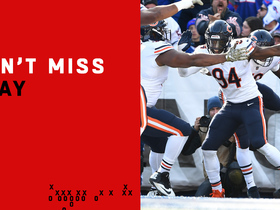 Analysis: Floyd finished the year with only four sacks but was still a key asset on a Bears defense that finished first in the NFL in scoring defense in 2018. Chicago's pass-rushing personnel should remain a formidable unit next season with Floyd, Khalil Mack (knee), Aaron Lynch and Isaiah Irving on the edge. 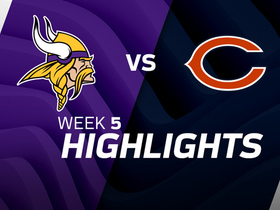 Floyd notched eight tackles in the Bears' Week 17 win over Minnesota, and he closed out the season with 49 tackles and four sacks. Floyd collected a pair of sacks and six tackles in the Bears' 24-17 win over Green Bay. Analysis: Not only did Floyd post his first multisack game of the year, but he also posted a season-high in tackles. He's come on strong in the second half of the season, as he's notched four sacks along with a pick-six over his last seven games, and he's a player to use for upside in weekly lineups. Floyd tallied a sack and three tackles in the Bears' Week 13 overtime loss to the Giants. Analysis: Although he's had a fairly quiet season, Floyd has been coming on lately, as he's notched a pair of sacks and an interception over the last five games. While he's an inconsistent IDP with a low floor, his ability to make plays gives him weekly upside. Floyd posted a sack and a tackle in Chicago's Week 10 victory over the Lions. 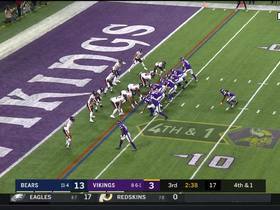 Analysis: After returning an interception for a touchdown last week, Floyd followed that up with his first sack of the season. Unfortunately, he's averaging fewer than three tackles per contest, and his weekly downside may be too significant to overlook when considering him in fantasy lineups. Floyd scored a touchdown on an interception while adding three tackles in the Bears' 41-9 win over the Bills. 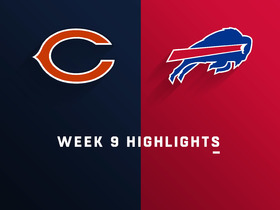 Analysis: Floyd had an easy score when intercepting an ill-advised pass by Nathan Peterman in Chicago's blowout victory. Despite his big play, he's yet to record a sack in 2018, and he's failed to establish himself as a reliable IDP in 2018. Coach Matt Nagy said Floyd will likely have the use of his fingers against the Cardinals on Sunday, Larry Mayer of the Bears' official site reports. Analysis: Floyd is also likely to have a smaller club on his broken hand, Nagy said. The starting linebacker has been participating in practice and suiting up for games despite the injury, but Floyd is obviously not 100 percent without the full use of his right hand. Already a key piece in Chicago's defensive scheme, it's worth monitoring whether the 26-year-old sees an increased role whenever he manages to fully recover. Floyd (hand) wasn't among the players on the Bears' injury report Tuesday, Colleen Kane of the Chicago Tribune reports. Analysis: Floyd went through a light practice session Monday and appears to have progressed to full participation Wednesday with the regular-season opener Sunday night against the Packers looming. There's nothing at this point to suggest he won't suit up for the contest. Floyd (hand) went through a light practice Monday while wearing a club on his right hand, Patrick Finley of the Chicago Sun Times reports. "He was out there running around, just going through his assignments," head coach Matt Nagy said. '"Nothing's affected with his legs, so he was good there. You just gotta get used to feeling how that is with your hand in a club. But he did well." Analysis: Floyd is expected to play with a club on his hand in Sunday night's season opener against the Packers, which means he will spend the entirety of this week getting used to operating under those conditions. Look for more updates to come when the Bears release their official injury report. Floyd (hand) is expected to play Week 1, Patrick Finley of the Chicago Sun-Times reports. Analysis: The beginning of Floyd's career has been somewhat marred by an assortment of injuries. Fortunately for both Floyd and the Bears, his recent surgery isn't expected to keep him out of the regular-season opener. The hand situation will be something to monitor leading into the regular season, but it doesn't seem to be all that serious at the moment. Floyd underwent surgery on his fractured right hand Sunday, The Athletic's Kevin Fishbain reports. Analysis: Floyd went down with the hand injury during Saturday's preseason tilt against the Broncos, but the Bears are optimistic he'll be available for Week 1 of the regular season despite his recent surgery. The starting outside linebacker wouldn't be at 100 percent, but he could potentially play with a club or cast on the hand at that point. In the meantime, Isaiah Irving and Kasim Edebali could see additional reps with the first-team defense across from Sam Acho. Floyd will undergo further testing after injuring his left hand during Saturday's 24-23 preseason win against the Broncos, Rich Campbell of The Chicago Tribune reports. Analysis: Floyd's injuries keep stacking up, as he missed the final six games of 2017 and all spring practices after having surgery on his MCL and PCL. He was spotted wearing a hard cast after the game, but there was no comment on the severity of his injury. The Bears' next preseason game is Saturday against the Chiefs, so the results will be available by then. Floyd suffered a hand injury and will miss the rest of Saturday's game against the Bears. Analysis: Floyd was injured during the second quarter. The severity of the injury is not yet known, so consider the 25-year-old linebacker day-to-day. Floyd, who underwent surgery last November to repair PCL and MCL sprains in his right knee, has shown speed and explosiveness in pass-rush drills in training camp Rich Campbell of the Chicago Tribune reports. Analysis: Floyd got off to a bit of a slow start in late July during his return from the aforementioned knee injury, but he didn't miss a single practice and has since returned to full strength. The outside linebacker has appeared in just 22 games since entering the league in 2016, but the former first-rounder should boast Chicago's pass rush if he remains healthy in 2018. Floyd (knee) went full speed on the field during the Bears' OTAs last week and should be fully cleared for training camp, The Athletic Chicago reports. Analysis: Floyd continued his progression from the MCL and PCL sprains he suffered in his right knee in November, finally getting onto the field last week with a brace on his right leg. The 25-year-old will now have plenty of additional time to rest up before training camp kicks off in mid-July, as he is expected be a main cog in the Bears' pass rush in 2018. Floyd has played only 22 games over his first two seasons, recording 11.5 sacks, two safeties and a forced fumble. Floyd (knee) has started to go through 7-on-7 drills this week and should be full speed for training camp, Kevin Fishbain of The Athletic Chicago reports. General manager Ryan Pace said he expects Floyd (knee) to be ready for the Bears' offseason program, Adam Hoge of WGN Radio reports. Analysis: Floyd's 2017 season ended prematurely after the 2016 first-rounder was placed on injured reserve in November with a sprained MCL and PCL in his right knee. It's fortunate he didn't suffer any damage to his ACL, as that likely would've required a longer recovery time and forced him to miss a portion of the Bears' offseason program, a notion that doesn't seem to be of any concern anymore. Floyd (knee) will be ready for 2018 training camp after undergoing surgery on his right MCL and PCL, Patrick Finley of the Chicago Sun-Times reports. Analysis: It's good news that the Bears don't believe this will be a long-term injury since Floyd looked like a key player on the Bears' defense this season. The second-year pro notched 34 tackles, 4.5 sacks and two pass breakups through 10 games as a starter. Floyd (knee) was officially placed on injured reserve Thursday. Analysis: As expected, Floyd's season is officially over after he was diagnosed with MCL and PCL sprains in his right knee. The linebacker will undergo surgery within the week. Floyd's absence will leave a gap within the Bears' defensive front, and they'll use his roster spot to promote linebacker Howard Jones to their active roster. Head coach John Fox said Floyd (knee) will "more than likely" be placed on injured reserve, Patrick Finley of the Chicago Sun-Times reports. Analysis: Floyd sprained the MCL and PCL in his right knee during Sunday's loss to the Lions, but it isn't clear if he's decided to undergo surgery. His loss serves as a big blow to the Bears defense, as the 2016 first-rounder finishes his second campaign with 33 tackles, 4.5 sacks and one fumble recovery across 10 games. Isaiah Irving stands to take on additional snaps in his absence. Floyd (knee) was diagnosed with MCL and PCL sprains in his right knee after undergoing an MRI on Monday, Rich Campbell of the Chicago Tribune reports. Floyd's (knee) MRI results Monday revealed his ACL is still intact, Rich Campbell of the Chicago Tribune reports. Analysis: It is unclear to what extent his MCL is damaged, but his avoidance of an ACL tear means he will likely be able to recover in time for the Bears' 2018 offseason program. Floyd has not been officially shutdown for the season, but coach John Fox described the issue as "fairly serious." Some combination of Pernell McPhee, Sam Acho, and Isaiah Irving figure to fill Floyd's void at outside linebacker. 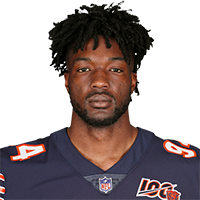 The Bears are fearing that Floyd will miss extended time due to the right knee injury he suffered in Sunday's 27-24 loss to the Lions, Brad Biggs of the Chicago Tribune reports. Floyd hurt his knee during Sunday's game against the Lions and won't return, Adam Jahns of the Chicago Sun-Times reports. Analysis: Floyd has played all nine games this season, accruing 29 tackles (19 solo) and 4.5 sacks. The 25-year-old has the second-most sacks on the Bears' roster, so they may struggle if this is a long-term issue. Expect Sam Acho and Isaiah Irving to rotate in at outside linebacker in Floyd's place. Floyd recorded half a sack and four tackles in Sunday's 23-16 loss to the Packers. Analysis: Floyd continues to consistently pressure the quarterback and has recorded at least a partial sack in four of his last five games. After not posting a sack over the first three weeks of the year, he has 4.5 over his last six games and has served as an outstanding IDP option. 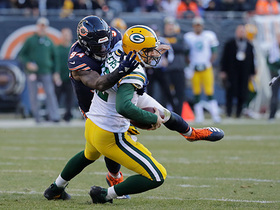 Chicago Bears linebacker Leonard Floyd sacks Green Bay Packers quarterback Aaron Rodgers for a loss of 18 yards. 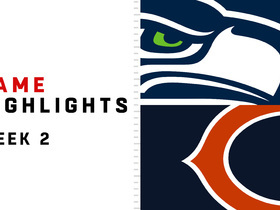 Watch the highlights from the Week 2 matchup between the Seattle Seahawks and the Chicago Bears in 2018. 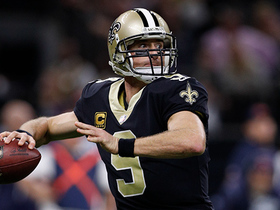 New Orleans Saints quarterback Drew Brees becomes the 3rd player in NFL history to reach 6000 completions on a 7-yard completion to wide receiver Michael Thomas. 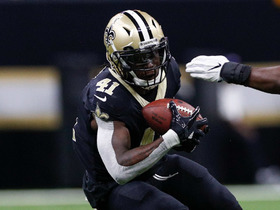 New Orleans Saints running back Alvin Kamara pulls in a tough 34-yard catch in tight coverage on a pass from quarterback Drew Brees. 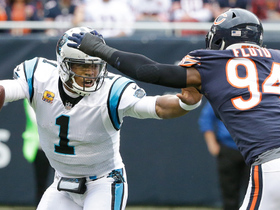 Chicago Bears linebacker Leonard Floyd sacks Carolina Panthers quarterback Cam Newton.